The driver says his window was fogged with morning dew, and maybe steam from his cup of tea, and he didn’t see my dad. Since then I’ve walked and airplaned and ridden in cars and taken subways. And soon I’ll be back on my bike, figuring out how to ride again through the fear, because what else can I do. I’m scared of cars, yes, but also what it will feel like to do the thing my dad and I both so loved doing. It was the way we connected with each other, and now he’s gone. My heart is in pieces. 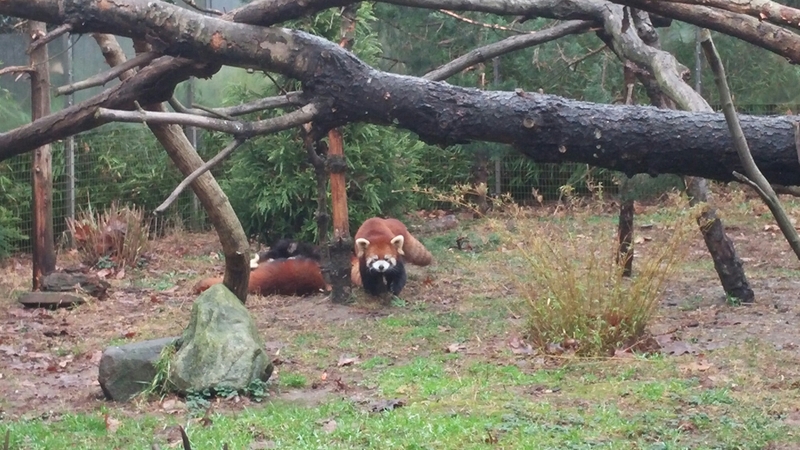 I spent much of today staring at these red pandas playing at the zoo, thankful for the few minutes they let me see them and smile, a short distraction from the dark edges of grief and anger that are my whole world right now. Please, drivers, pay attention. And yes, dear bicycle, I’ll be back for you on Monday. I’m very sorry to hear about your Dad Kate. Sending warm thoughts to your family and I hope that the bike can always serve as a reminder of the special time that you and your Dad shared together. So sorry about your loss of your father. Tough to take, no matter what the circumstances. Your writing gives us all pleasure, solace and comfort, and now it’s time for your readers to provide same to you. Best wishes…..